A lifetime of healthy teeth and gums starts by developing good habits and routines at an early age. The Centers for Disease Control and Prevention has reported that over 19 percent of children 5 to 11 years old have untreated cavities. Children’s Dental Health Awareness Month is a perfect time to get your child on the right track to a healthy smile for life. Lisa Juliana, PHDHP at Sadler Health Center, answered some common questions on children’s dental health and how to create healthy habits for your children through adulthood. Q. When should I schedule my child’s first dental visit? Remember this: First birthday, first visit. As you get things ready for your child’s first birthday party, don’t forget to schedule his or her first dentist visit, too. The American Academy of Pediatrics recommends a dentist visit by this age in order to prevent any early childhood cavities. Q. How often should I schedule appointments? Bi-annual dental check-ups with your pediatric dentist can ensure your child is not one of the 25 percent of children who develop a cavity by the age of 5. 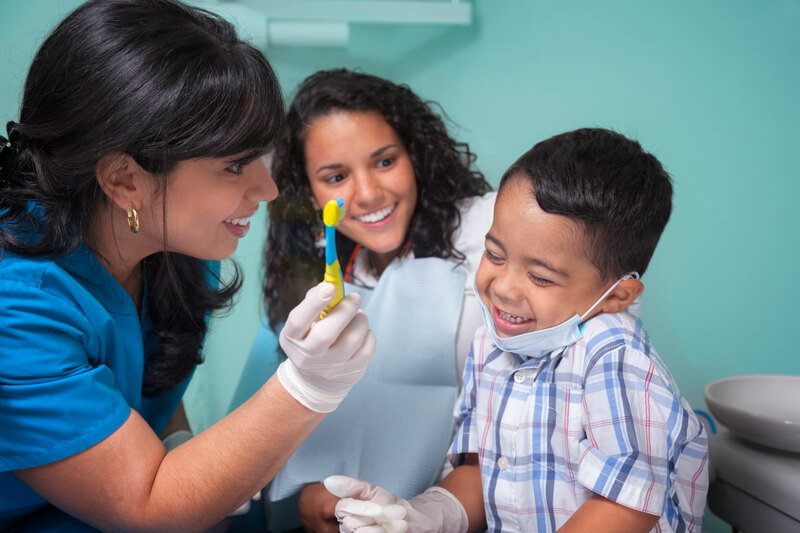 Your dentist can also be a great source for tips and tricks on pediatric children’s dental oral health, oral hygiene and how to best implement them with young children. Q. When kind of toothbrush does my child need? Shopping for toothbrushes can seem a bit overwhelming when there are so many varieties to choose from. It’s important to remember that your child’s needs are very different from your own. Other than choosing a size comfortable for their mouths and hands, keep your eye out for toothbrushes with soft bristles. One made from a round-ended material, that seems almost “polished” is the way to go. These brushes are gentle on your child’s gums and still remove the cavity-causing plaque you want to avoid. Q. When should I begin using toothpaste? The American Academy of Pediatrics recommends fluoride toothpaste for all children starting at tooth eruption, regardless of any cavity risk. A small smear on a toothbrush is enough to get the job done; graduate to a pea-sized amount once your child is three to four years of age. Remember that the flavor of mint toothpaste is oftentimes a bit strong or uncomfortable for children, so a different flavor may be better received. Q. How can I get my child excited about brushing his/her teeth? Brushing teeth can easily become a fun activity and less of a chore for kids if you incorporate a few fun elements. Allowing your child to pick his or her own toothbrush, or picking one yourself that has fun colors, characters, and designs can make it something they look forward to every morning and evening. Need to schedule your child’s first dentist appointment? Get to know our Pediatric Dental Health Services and Dental Providers at Sadler Health Center, and learn how to Become A Patient. Welcome to the new Sadler Health Center website!